The hippocampus is known to play a critical role in declarative memory, however the exact computations carried out in the hippocampus have been quite elusive. Over the past decade, empirical data across animals and humans has demonstrated that, consistent with computational models (e.g. McClelland et al. 1995; Norman and O’Reilly 2002), the hippocampus is involved in pattern separation, the process of orthogonalizing similar experiences using distinct neural codes (cf. Yassa and Stark, 2011 for a recent review). 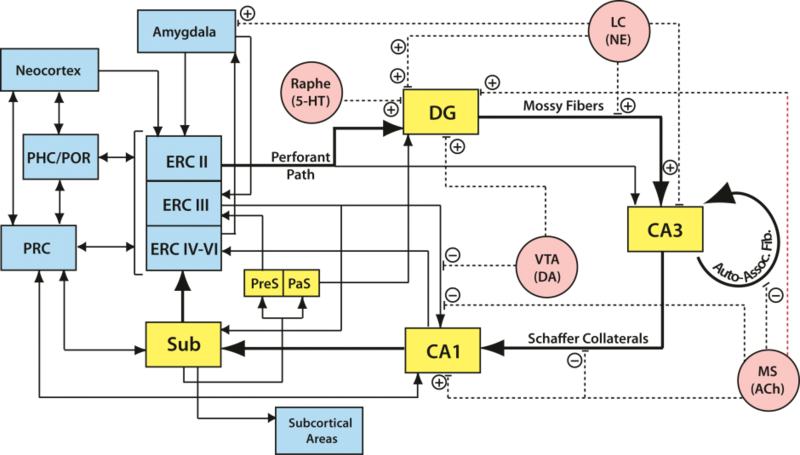 The hippocampal circuitry is complex with multiple input/output pathways. We are attempting to understand the different computational capacities in subregions of the hippocampus and the medial temporal lobe, as well as the information content processed and perhaps stored by each of these regions. The hippocampus receives spatially segregated input from different subdivisions of the entorhinal cortex (medial – MEC and lateral – LEC), which in turn receive large inputs from the parahippocampal (PHC) and perirhinal (PRC) cortices respectively. The seminal discovery of grid cells in the MEC (Hafting et al., 2005) as well as the relative absence of spatially tuned cells in LEC reported by Hargreaves et al. (2005) has led to the proposal that entorhinal inputs to the hippocampus are organized as an extension of the PHC-PRC spatial-nonspatial dissociation. Evidence for this in humans has been elusive thus far. We have developed a novel task that simultaneously assesses object and spatial pattern separation, with the latter based on varying metric distances between the study and test items. Using high-resolution fMRI, we are currently testing the double-dissociation that object pattern separation will be selectively associated with PRC-LEC processing, while spatial pattern separation will be selectively associated with PHC/MEC processing. We further hypothesize that the DG/CA3 will not be selective to spatial vs. nonspatial information (i.e., domain-agnostic), while the CA1 may show selectively based on proximal vs. distal segments preferentially afferented by MEC vs. LEC respectively. Thus far, our data is highly consistent with a PRC/LEC vs. PHC/MEC division of labor, and furthermore with hyperdimensional pattern separation in the hippocampus. Our data suggests that some rudimentary form of pattern separation may be occurring in MTL cortices upstream of the hippocampus, and that ultimate orthogonalization is instantiated in the DG-CA3 network. Time is an essential component of episodic memory, and recent studies have shown that hippocampal neurons are modulated not only by spatial location (i.e., place cells) but also by temporal duration (i.e., time cells; MacDonald et al. 2011). We propose that the DG plays a similar role in temporal pattern separation as has been proposed for spatial pattern separation. The function of temporal pattern separation is to allow the hippocampus to disambiguate information that is presented in temporal proximity. If hippocampal memory storage were modulated by time, then patterns of neural activity would change over time and produce less correlated temporally contiguous memories. We hypothesize that the dentate gyrus creates temporal signals that are reset by behaviorally relevant events and that encode time at a finer scale than the entorhinal inputs (i.e., temporal pattern separation). We are pursuing this possibility by using high-resolution fMRI during a novel temporal interference task that we developed.